The Braven BRV-1 Bluetooth Speaker has a bullet proof like appearance and was built for the outdoors and we wanted to know if sound quality was still present due to all this ruggedness. Lets find out. 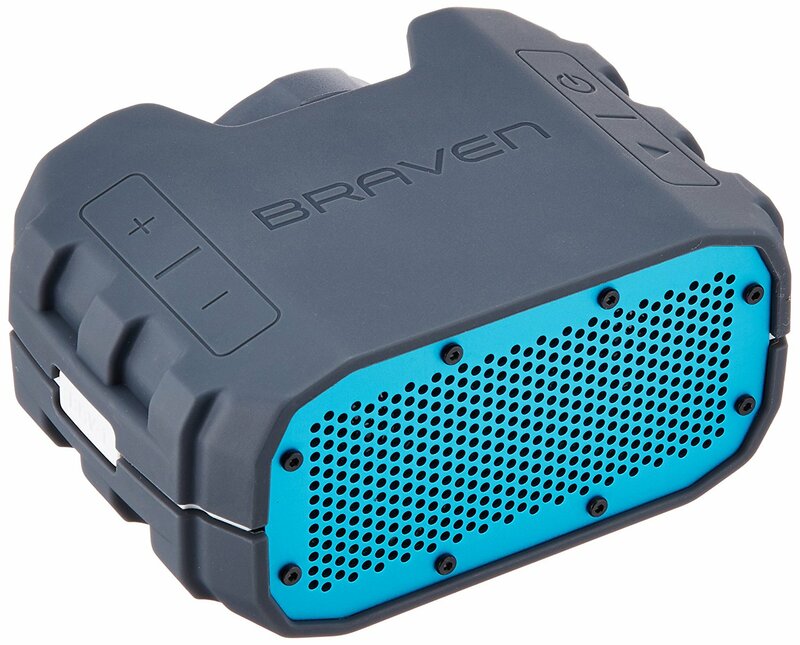 The Braven BRV-1 is covered in a rubberized body and has a metal grill for the front. The speaker feels good in the hand and feels like it wouldnt break if dropped which is a good sign. There are two pairs of buttons, on the left you have the volume controls which also act as shuffling songs back and forth and on the right you have the power and Bluetooth pairing. In the back of the device you have a cap that protects from water and dust and beneath that cap you will find 5 LEDS to show battery life when you press the battery button, you will also find a USB input to charge your other devices, a micro USB and a 3.5mm Aux input in case you want to go wired. The speakers internals are pretty much the same as in the Braven 600 which we think is a good thing. In the front beneath the metal grill you have your two 40mm drivers which take care of the mid-range and upper frequencies. The passive radiator is located on the bottom of the speaker to allow for lower frequencies. The speakers Dimensions are 3.3 x 5 x 2.2 inches and the speakers weight is 12.2 Ounces which is less than a pound so this speaker is very light and looks a lot heavier than it really is. The Braven BRV-1 includes features such as a 12-15 hour battery life which was tested and we managed to squeeze out 13 hours on volume levels between 60 and 90 percent. Also this feature packed speaker includes speakerphone, smartphone charging and Bluetooth 3.0 which allows for better signal. We dumped a bottle of water on the speaker which made it muffled for a couple of seconds but cleared up back to normal quickly so its safe to assume that it really is water resistant. So you do get plenty of nice features all wrapped up in a nice rugged shell with the Braven BRV-1 so now lets check out the sound quality. The Braven BRV-1 performed well in terms of sound quality. The sound was clear and crisp with no distortion on any level. The speaker doesnt have dedicated tweets so you cant expect anything to special from the higher frequencies and as far as bass goes you shouldnt expect any serious dub-step bass drop from a speaker the size of your alarm clock. What you can expect is well rounded great sound which the BRV-1 does nicely. The BRV-1 projected sound well indoors and outdoors. The speakerphone was crap. We tried having a conversation which produced a lag and stutter for both parties unless you where REALLY close to the speaker. So if you are buying a Bluetooth speaker for the purpose of speakerphone we would not be able to recommend the Braven BRV-1. Initially the Braven BRV-1 had a price tag of under $100 which I think is steep for this entry level speaker considering you can land yourself the Fugoo Style or a Bose SoundLink Mini but now the Braven BRV-1 Sells for under $100 from Amazon which we think is a much more suited and a very fair price to pay for this Feature packed little speaker. Slightly expensive for its size and performance. If you’re looking for a compact rugged, water-resistant Bluetooth speaker, the Braven BRV-1 is worth considering now that its street price has dropped to closer to $100.